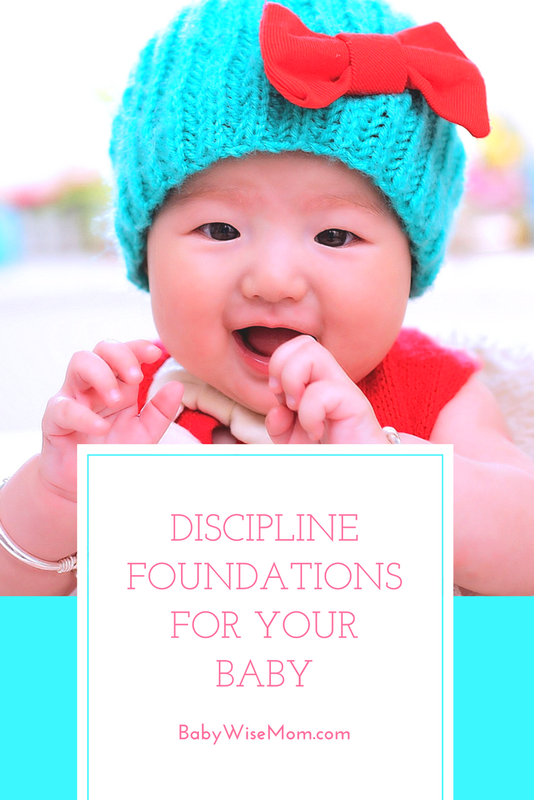 As your baby starts to show need for discipline, there are certain key points that are good for you to keep in mind. It is important for you to learn how to discipline effectively. On Becoming Babywise II explains that if parents set the right course, the baby is less likely to stray and will learn more quickly (page 69). To discipline is to train your child. When Brayden was a matter of a few days old, my Mom told me that I needed to realize that each day my job was to prepare him to leave me someday. I needed to teach him how to become self-sufficient. I needed to teach him the life skills necessary to become independent of me. Some might find that a sad notion, but that is our job as parents. Our children will have influences of teachers and friends, but for the most part, the world will not take a vested interest in training our children, though the world will apply all consequences even if our children are not prepared to face them. We need to train our children. That training is step by step over time. 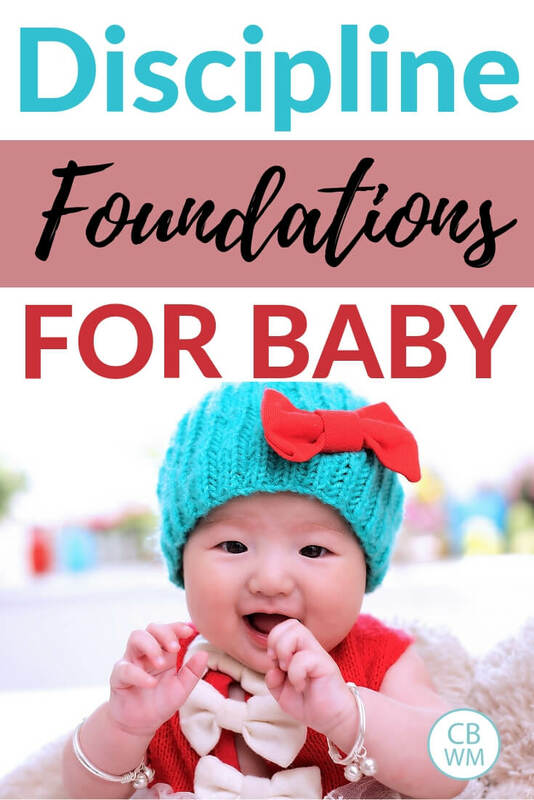 You can start that foundation with your baby. You might be thinking your baby can’t possibly do anything wrong and therefore doesn’t need discipline. It is important to take note of what discipline means. Discipline is training. “Discipline…is a process of training and learning that fosters self-control and moral development” (On Becoming Babywise II, page 83). You are realigning your baby to make sure she stays on the right path. We read in Babywise II that discipline and the need for correction doesn’t necessarily mean the baby did something wrong (page 84). Consistency is an esential foundation for your baby. Consistency is very important when it comes to discipline. “Immediate and consistent consequences speed up the learning process” (On Becoming Babywise II, page 64). The more consistent you are, the faster your baby will learn and the less over-all correction you will need to apply. It is difficult for your baby to know your expectations if you are inconsistent. Before your baby reaches the age for the need of discipline, it would be wise for you to think through possible actions your baby could do that would not be okay with you. Then think through what your reaction will be. Yes, it is hard to look to the future and see what your child will do. Start practicing now; it is a skill that will come in useful to you throughout the life of your child. You will definitely miss some, even if this isn’t your first child. But you can get an idea in your head. Be sure that in your quest for consistency, you don’t overlook the need to modify your approach. You can be consistent in your rules while still modifying your course of action with correction. Another important foundation for your child’s discipline is to have expectations for obedience. Have you heard the phrase that people live up to the expectations placed on them? “True obedience is often more difficult for the parent than for the child, for children always respond to parental resolve and expectations…” (On Becoming Babywise II, page 88). Think about your own reservations. Do you really expect your baby to obey you? If not, why would your baby do so? Don’t underestimate the ability of your child to read you, now and in the future. Every so often, I find myself giving an instruction to one of my children and realizing that I didn’t really expect compliance with it. The child does not respond. I will do a quick pep talk in my head and gather my resolve and repeat. It is amazing the difference simply changing my expectations makes. Another problem if you have improper expectations is that you likely will not apply correction if you didn’t mean it in the first place. Are you really going to correct your child for not doing something you didn’t expect to happen in the first place? If you don’t expect it, you are better off not instructing it. You must provide boundaries. If your child has too much freedom, she will get into trouble. You want to give freedom in manageable limits. To set boundaries is to limit activities and freedoms, but not to abolish them altogether. Read up on Why You Can Give Your Baby Rules and Boundaries and How to Set Boundaries for help in this area. You want to avoid power struggles with your child. Parenting is not about being the “top wolf.” If you have a dog, you probably know that if you want to be “top dog,” you need to look away last. This isn’t your goal with your child. A power-struggle will happen if you and your baby go head to head and you basically stand over him and stare him down until he relents. A better option is to allow him to surrender with dignity. See Discipline Strategy: Surrender with Dignity. Could you put an age range on this post besides “baby?” “Baby” covers a lot of turf. 🙂 Hugs! Sure, the age range is the same for that of the book On Becoming Babywise II, which is ages 5-15 months. For discipline foundation, though, you are looking at the beginning of discipline. 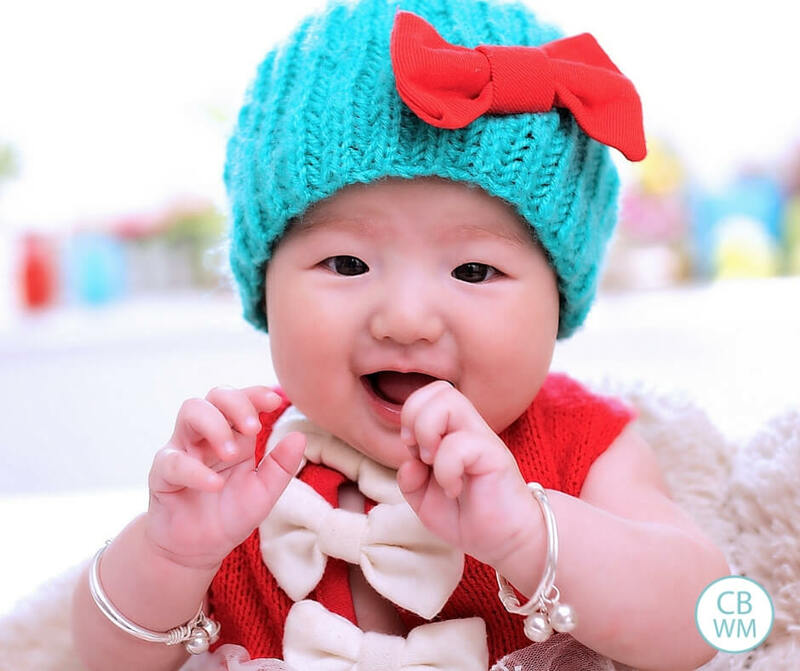 The age range for when babies start to show need for this is typically 5-8 months old. Hey! I have a question about my 17.5 mo old. She is beginning to refuse to come when I call her. We've been consistent with firm verbal instruction, "no's", hand squeezes… but it seems lately I always have to go get her when I need her to come somewhere. I know we need to start some type of isolation; we haven't yet. the only problem is that often when I need her to come, it's because it's time to do something or go somewhere and a time out seems impractical. Any advice? I feel like once we start time outs we're going to be doing them all day long!Thank you!! Sarah, you know, for that age I would actually just not let it happen. I think that for now, that is good enough. When she does come and obey, give her lots of verbal praise and give her a big hug. When she runs away, try your best to not let it seem like a fun game of tag. Pick her up and say firmly but without emotion, "That's a no. You need to come to mommy when she calls. You don't run away." Be super consistent about it and she should start to come around. The most important point is to not let her just run away–ever–and you do nothing after you have told her to come.